The student adviser to the regents is one of three students allowed to engage in dialogue with the regents. The student adviser, Edward Huang, is currently the only undergraduate on the board. CHP Archives. The UC regents will likely extend the two-year-old position of student adviser to the UC regents another year after UC student leaders expressed desire for the role to continue. On Dec. 17, Regent Richard Sherman released a letter to the Board of Regents indicating the position would sunset at the end of this school year, but in a subsequent statement on Jan. 4, he expressed support for the continuation of the role. The student adviser to the regents is one of three students who engage in dialogue with the regents during meetings. The other two are the student regent and student regent designate. Many student leaders in the UC pointed toward a miscommunication in the regents’ initial reasoning for letting the student adviser position sunset. The student adviser to the regents position lacks support needed to function in the best way, said representatives from the UC Council of Student Body Presidents, UC Student Association (UCSA) and Student Regent Devon Graves. But students wanted it improved rather than discontinued. Michael Skiles, graduate chair of the UC Council of Student Body Presidents, used an analogy to describe what happened when regents heard of student complaints surrounding lack of support for the position. Rather than implement support for the position, they originally moved to eliminate the position. The student adviser is often the only undergraduate representative on the board. The role contrasts the regent in graduate status. Student adviser to the regents Edward Huang said his position is crucial in representing the large undergraduate student body to the regents because the student regents have been mostly graduate students lately. While student leaders agree the role is necessary, they also agree it’s flawed. The student regent receives a tuition stipend, but the student adviser receives no pay or stipend to compensate for their work. UC Santa Cruz Student Union Assembly vice president of external affairs and chair of UCSA Davon Thomas said this can bar students who need to support themselves from holding the position. The student adviser needs more structure and support to be effective in advocacy, Huang said. Unlike the student regent, they have no staff, office or written out description of the role. Moving forward, Huang and other student leaders plan to push for that support in the role, and make it a permanent position. 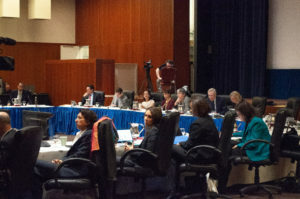 About 14 students, including student observers to standing committees and student advocates to the regents speak regularly at regents meetings. Most of them are only allowed to give comments and the student regent is the only student position with a vote on the board. After Sherman released his initial letter, student leaders from the UCSA, UC Council of Student Body Presidents and UC Graduate and Professional Council communicated full support for the continuation of the role to Graves. Graves then passed that information along to the regents, who also voiced support. The board is expected to officially decide to continue the role at its Jan. 15-17 meeting.